This week we have a special treat for you! A No. 40P catalog dating from 1939. Also new to the website, in addition to the catalog, is the price list for the No. 40 and 40P catalogs, effective June 1, 1939. We owe a big thanks to Reed Armour for graciously allowing his copies to be shared with everyone and to Greg Kareofelas for doing all the scanning. First it represents the state of art of P&C under John & Jessie Peterson. Only a few more years pass before the transition to Plomb ownership. Secondly, 40P illustrates a number of previously unseen displays, (at least unseen in our collection of catalogs at pnctools.com). The displays illustrated in the catalog range from the immense (3′ x 12’….yes, twelve feet long!) to small table top displays for holding a few wrenches at the check-out counter. Thirdly, this catalog illustrates some tools previously unseen in our collection of catalogs. Most obvious of these for me was the “E” series of round handled box wrenches. My personal collection contains a number of these “E” wrenches and here is a photo of a couple. The appearance of the wrenches and logos had me dating them from the 30’s & 40’s, so I was pleased to finally find them in the 40P catalog. Page 17 lists another unusual round handled box wrench. The “H” series; “Heavy Duty”, “from select alloy steel and designed to withstand hard industrial service.” I have never seen a “H” series wrench or one advertised on ebay or anywhere else. Have you? Another wrench I found in this catalog was the number 1205 obstruction wrench I recently picked up. Seen in this catalog for the first time, the wrench is described as a “No. 1205 12 Pt. Chev. Manifold and Starter Wrench.” Now if I just had a 1938 or 39 Chevy I could loosen the manifold and starter nuts. I also have a P&C 2006, a valve tool previously unidentified by me. Page 20 in the 40P lists it “For ’37 and older Ford motors”. 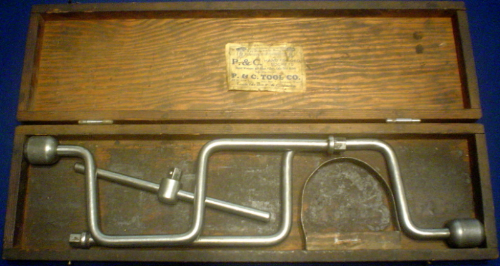 One of the “holy grails” of P&C collectors has to be the early wooden box tool sets. An example from the 1927 catalog is seen below. These boxes appear to have been made for only a few years in the early history of P&C. While seen in the 1927 Catalog, wooden boxes appear to be absent in the 1928, or at the very least, a mix of metal and wood. The labels in 1928 were very different and were hexagonal in shape. 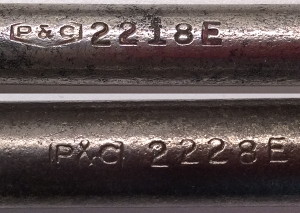 Two different styles of hex labels are seen in the 28 catalog; one that may have been adhesive and another that might have been riveted in place. If we assume wooden boxes were made from 1923 to about 1928, there is little wonder they are rare. Even more rare is finding such a box with an intact paper label. One featured on the website is on the “Patents” page. 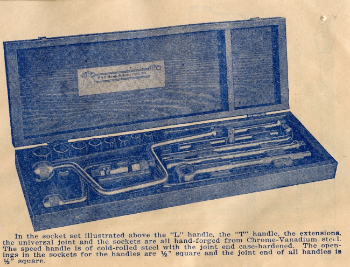 If you scroll down to the second patent, at the bottom of the listing, there are links to pictures of that particular tool in one of these rare wooden boxes…thanks to Greg Kareofelas. 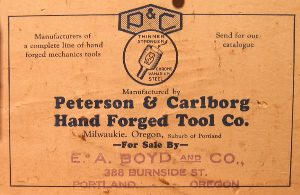 The labels are generally in a format where they leave room for a distributor’s stamp, as seen in this example to the right, courtesy of the Milwaukie Historical Society. In this example, no distributor was noted and the space is obviously blank.. Troy Dietz recently sent me photographs of one of these rare wooden boxes he discovered. This box label presents an interesting twist. Below is a photograph of the box and contents. At the bottom of the page you can see a closeup of the paper label. A little tattered it still looks good for 90 years of age. As you can see it follows a slightly different format than the labels seen above. Instead of “For Sale By”, the wording is now “Sole Distributors”. The distributor is printed instead of stamped and listed as “P. 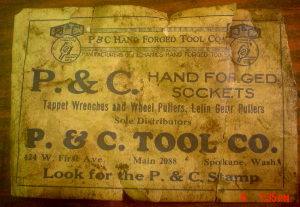 & C. Tool Co., 424 W. First Ave. Main 2088, Spokane, Wash.”. The label seems to indicate the presence of a P&C Tool retail outlet store in Spokane. Indeed, the address is an early business district in Spokane. Based on information from Jim Peterson, we know P&C did have a similar store in San Francisco. The label raises many questions: How many similar small retail stores did P&C have during this time period? What other evidence remains regarding these stores? Why did P&C pull back from this marketing strategy? While in McCall, Idaho last weekend visiting family, I took time to visit the Central Idaho Historical Museum. Primarily searching for any old photograph’s of John & Charlie’s early blacksmith shop/garage there, I was given a biography of Ben & Stella Johnson as remembered by their daughter Ione. Stella was Jessie Peterson’s sister. Included in the 17 pages was the following paragraph, which I have included in the website in the page entitled, “Idaho Years of P&C Tools”. The account reveals an interesting side business that Charlie and John engaged in…the first Ford dealership in McCall. I’m not entirely sure John & Charlie invented tools just for assembling the Model T’s but that very well could have been part of the equation. Shrewd planning. Revenue from the sale of Model T’s would have been nice, but ongoing maintenance and repair would have kept them in business for awhile…especially with Model T’s! 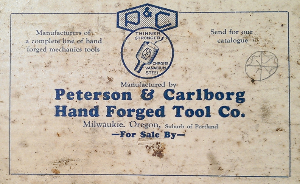 Since the Jamestown factory was acquired by Plomb in 1947 it is doubtful that P&C could have completed all the necessary steps (including adding this section in a 1947 Catalog) of adding these tools to the lineup in 1947. A new price list was issued by P&C to suppliers in May of 1949, which applied to catalog No. 48. The No. 48 catalog covering 1948 seems to be the most likely scenario based on the facts above. I have added two catalogs since the last post. The No. 48 and a No. 32 that appears to cover from 1931-1933. The No. 48 is chock full of tool display boards. It is a large catalog that is well organized and easy to read and follow. The catalog is larger than it’s predecessors. Slightly taller but much wider. The catalog is identified on the cover as, “CATALOG No. 32 – Copyright 1931” but contains an extensive supplement section at the back with hand drawn illustrations and hand typed & mimeographed text. The supplement sections are dated consecutively and run through Feb. 23 of 1933. This supplement was bound separately and glued into the back of the catalog. The question now is, did P&C save some money by not issuing catalogs for 1932 and possibly 1933 by creating their own supplements, binding them into the most recent catalog and distributing them? That would appear to be very likely from the look of this catalog. And would make sense especially during the depression years. A number of new tools are seen for the first time in this catalog. Gear pullers, Ball Peen hammers, pliers in a number of variations, open end wrenches of various types, an adjustable wrench!, “new style” ratchets, etc., even airplane tools for the first time (page 51). Also on page 51, and elsewhere in the catalog, some of the prices have been crossed out and lower prices hand-written the side. Not sure where Keith got this catalog, but if it was a “rescue” from the razing of the factory, that would be interesting. Not sure how I could make that sound more innocent…”rescue” is such a nice word. 🙂 I’m sure the statute of limitations is well over Keith. Finished and published the last major history page for the site. Also finished tweaking the mobile side of the website for mobile phones and tablets. Next items planned include adding newly acquired catalogs, a tool page and Keith’s page. Today is a blustery day…as Winnie the Pooh would call it. A good day to update and work on this website. The biggest visible update is adding a great picture of the old “schoolhouse” building that was the basic beginning of P&C in Milwaukie. The picture was most likely from 1923 and shows the building in need of paint and obviously with little recent use. A single model T is parked in front…most likely John or Charlie’s. You can find the picture at the top of the “P&C Factory: John & Charlie” page. Thanks to the Milwaukie Historical Society for that great pic. Keith had given me a copy of the photo last year but it was a photocopy of a photocopy. At the Milwaukie museum I found one that was closer to the original and the resulting scan was much better. Less obvious changes are re-naming the headings and page titles under the “P&C Factory” menu title, cleaning up the html coding for all the pictures on the website as well as optimizing the alt tags associated with the pictures, backing up the html for each page in case of disaster, etc. The “P&C Factory: 1941-1990” is completed and I should make it visible in the next few days. Just letting it “perk” a few days for more proofreading and error checking. I recently added the P&C Store Sales Brochure found under “Extras” in the menu. The brochure was found at the recent visit with the Milwaukie Historical Society. During the 50’s and 60’s, tool sales from P&C “lazy susan” displays contributed to a large increase in P&C sales. This brochure encourages store owners to carry P&C displays and their preferred means of positioning and maintaining the displays. This brochure dates to the 1947 to 1952 time period, based on information found at the back of the brochure. Specifically, “whose present four-factory operations in Portland, Los Angeles, Chicago and Jamestown, N.Y…” Plomb acquired the Jamestown factory in 1947 and added factory number five, the London, Ontario factory in 1952. This brochure would have been printed in that time period. On April 14, 2015, I was fortunate enough to be invited to the monthly meeting of the Milwaukie Historical Society in Milwaukie, Oregon. I took with me my friend and partner for this website, Keith Rumgay. The meeting was a small gathering crowded into a back room of the museum. Keith and I were able to wirelessly tether my iPad to a television so I could show pages and images from the website. 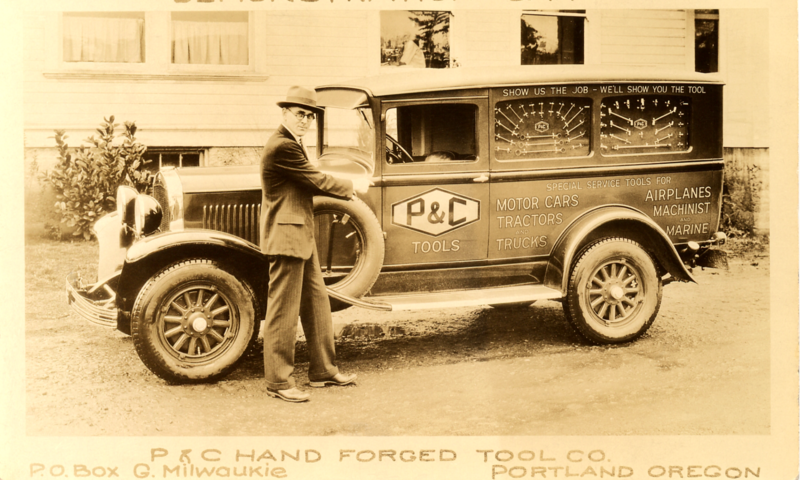 Keith answered a number of questions regarding the P&C factory and tools and I was able to explain our project of preserving the history of P&C with the website. Afterwards, while eating refreshments, we were shown the P&C tools at the museum as well as a binder of newspaper excerpts and photographs. I was graciously allowed to select items from the binder for scanning and David volunteered to scan them for me later. Many of these items now comprise essential photos and documentation in this website. Keith and I are very appreciative for the cooperative and friendly people that comprise the Milwaukie Historical Society.